As Estela Montoya watches her son Fernando Ramirez keeping a close eye on the younger kids in the swimming pool, she can’t help but remember that it was just a couple years ago that he started the lifeguard-training program. Now, at age 17, he is one of the lifeguards who will be on duty this summer at the Glassell Park swimming pool. Montoya and her son are among the thousands of families who will benefit from “Operation Splash,” a program that offers a variety of swim programs to low-income families. She told EGP that it was friends and neighbors who a few years ago first told her about the free swimming lessons available at Glassell Park, and she decided to enroll her son. “This is good for most of us because we don’t have swimming pools at home,” she said. “It gives us a fun place to bring our children,” she told EGP. Just in time for summer, Operation Splash is back for its 9th consecutive year at 33 pools throughout the City of Los Angeles. The three-month program from June to August, offers free-swim lessons to low-income youth and adults. At 22 pools, youth, ages 10-17, can take part for free in the junior lifeguard program, the same program that prepared Ramirez for his lifeguard job this summer. “He works here and enjoys it very much,” said his proud mother. “Now he knows how to take care of the kids” as they swim, she said. 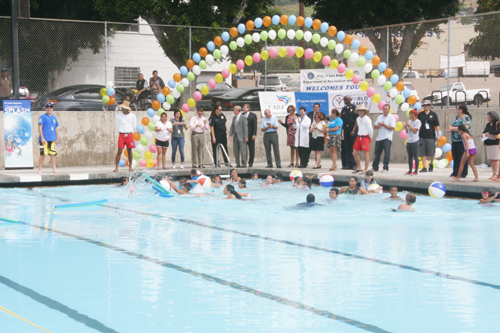 On Tuesday morning, the 2014 Operation Splash summer program was kicked off at Glassell Park pool. Among those attending the opening ceremonies was First District Councilman Gil Cedillo, who represents the northeast Los Angeles neighborhood. “The one thing government has to do is get more public space for the community,” said Cedillo as he welcomed the group of children standing by ready to jump into the pool. “Through Operation Splash low-income families are able to come and learn how to swim for free,” Dr. Jack Der-Sarkissian with Kaiser Permanente told EGP. “We want kids to be active this summer and enjoy [their] local pool,” he added. Operation Splash is a partnership between Kaiser Permanente, LA84 Foundation and the Los Angeles Department of Recreation and Parks. It is part of Kaiser Permamente’s Healthy Eating, Active Living (HEAL) program, focused on reducing obesity by encouraging more safe physical activity and healthy, affordable food. LA84 Foundation is a legacy of the 1984 Olympic games and its vice-president, Patrick Escobar, told EGP that for the last 28 years they have given yearly grants to the City of L.A. Department of Recreation and Parks for the swimming programs. “After they learn how to swim they can participate in other activities, such as water polo, synchronized swimming and diving, which we also support,” Escobar said. Although the Kaiser grant is only for the summer programs, the LA84 Foundation’s grant is good year-round and helps support the lifeguard and water sports programs. “We are very fortunate to have the Junior Lifeguard program,” said Vicki Israel, assistant general manager of parks and recreation. She said her department eventually hires many of the junior lifeguards to work as [real] lifeguards. “We do not only get them hooked on swimming, but they get jobs in the future,” she said. “There’s nothing wrong with learning about swimming and water safety,” she added. This year, with the help of the $265,000 grant from Kaiser Permanente and $84,000 grant from LA84, the Operation Splash summer program will offer 6,000 swim-lesson scholarships to low-income families; 780 youth will take part in the Junior Lifeguard program, and parks and recreation centers will host over 2,000 youth in its competitive swim programs, including Special Olympics athletes-in-training. 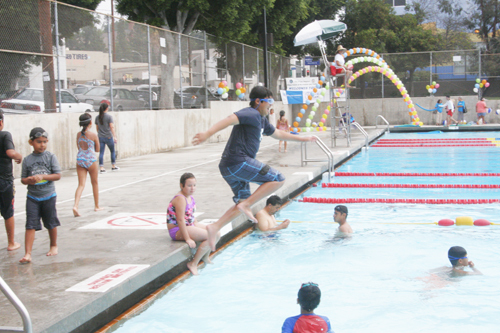 Richard Rincon, aquatics facility manager at Glassell Park pool, told EGP that their site stilll has about 75 scholarships left for youth ages 4 to 17 and adults. “For the 4-7 year-olds class, we have the parent go with the child in the water,” Rincon said. In total, out of the 6,000 scholarships available, only 3,500 have been given out across the city, Israel said. Escobar said the LA84 Foundation encourages parents to teach their kids to swim, because “drowning is the second highest cause of death among children,” He said it’s also never too late for parents who also want to learn to swim, since they offer classes are for all age groups. “Parents shouldn’t be afraid to bring their kids if they don’t know how to swim,” Escobar said, “We have lifeguards that are properly trained to take care of them,” he said confidently. In Northeast L.A., the pool programs taking part in Operation Splash this summer, include; Glassell Park, Highland Park, and the Yosemite Recreation Center in Eagle Rock. On the eastside, Costello, Pecan, Richard Alatorre and Roosevelt are in the program. For more information and locations, visit www.laparks.org or call (323) 906-7953. June 26, 2014 Copyright © 2012 Eastern Group Publications, Inc.